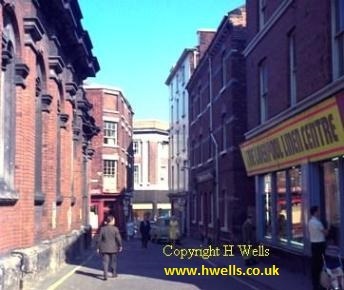 Buttermarket Street, Horsemarket Street and the old Market Place could be covered in future volumes, and possibly the Palmyra Square district. However, there are no more titles planned this year. 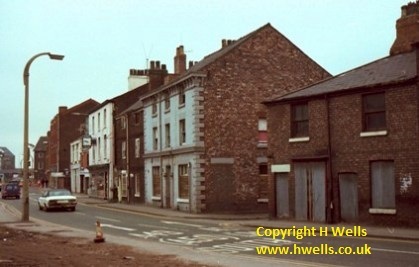 Lyme Street, Monday 13 August 1973. 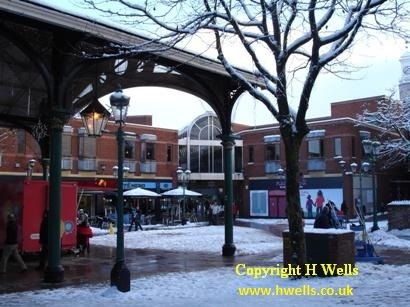 The mall entrance is now here as seen in the picture below. 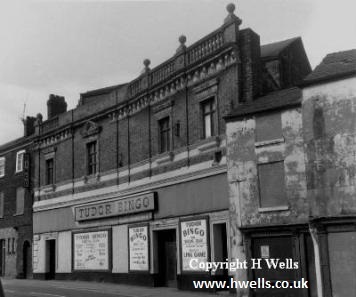 The old theatre on Scotland Road which became the Regent cinema then the Tudor Bingo hall. 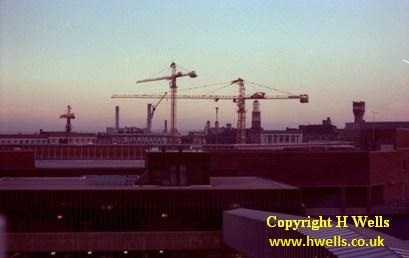 Photo taken on Thursday 29 August 1974. 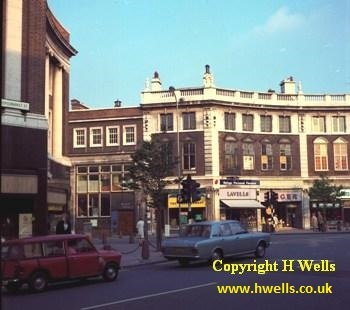 The theatre was demolished to make an extension to a car park. 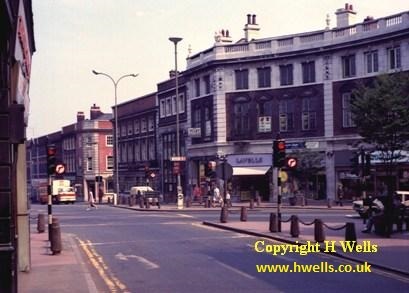 Looking into Cheapside, Monday 21 August 1972. 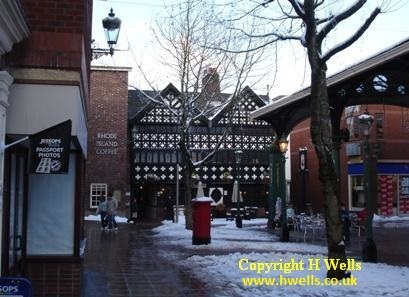 Old market hall on the left. 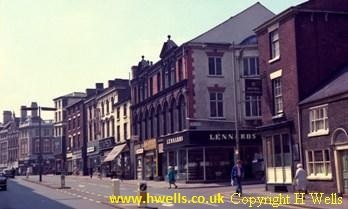 Looking the other way towards the 'Old Town Hall' (although it was never used as such) on Thursday 10 August 1972, with the local street urchins. A poster tells us that If was on at the Queen's Hall, Widnes. 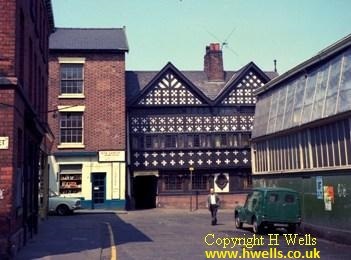 Market Place, Thursday 20 July 1972. Still quiet. 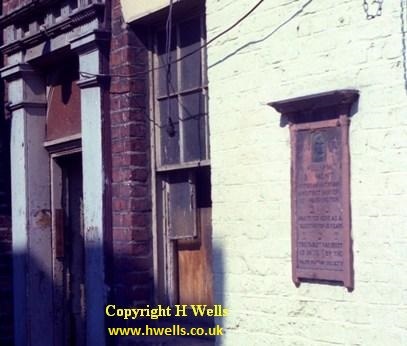 The plaque to William Beamont in 1973. This disappeared during demolition and a replacement was installed. The premises are now part of the Rhode Island cafe. 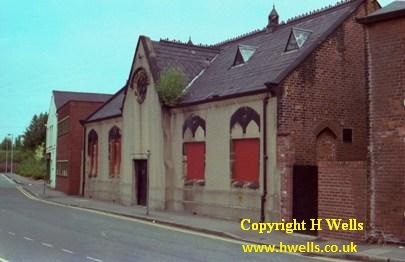 The Dissenters' chapel early in 1996. 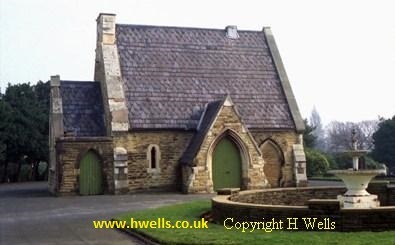 This interesting little building with patterned slates has now been demolished, destroying the architectural balance of the cemetery. 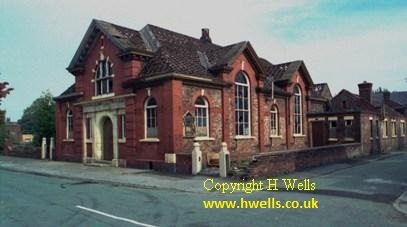 The RC chapel was demolished a few years earlier. 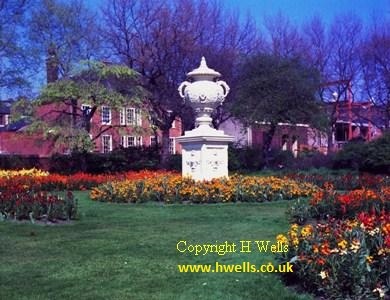 It is many years since the fountain was in use and the basin full of water lilies. 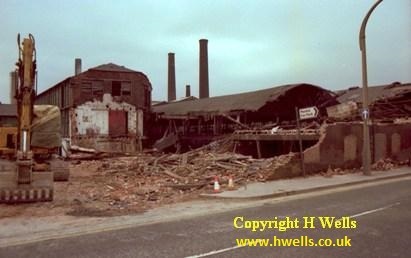 Demolition of the power station has begun early in 19809. 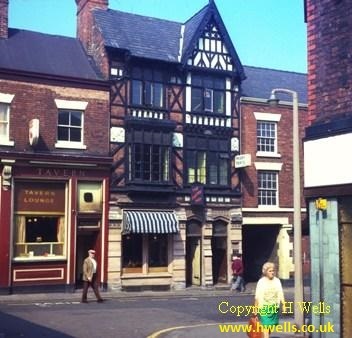 This view is looking down the bottom of Bank Street towards Mersey Street. 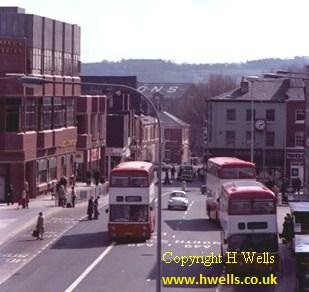 The exit from the Market multi storey car park is on the right. All the buildings in sight have now disappeared. March 1980. 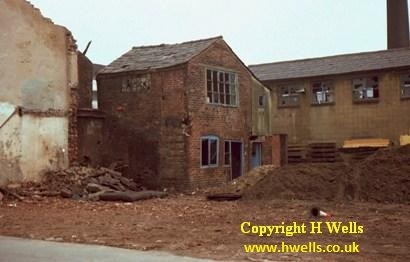 Demolition of tannery buildings on the south side of Mersey Street ready for road widening. 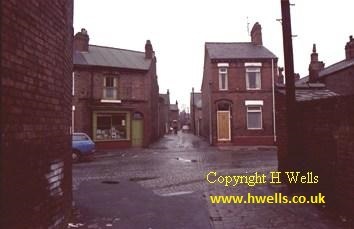 Mersey Street in the winter of 1979-80. Demolition has begun in preparation for road widening. A number of very old properties were lost along here. 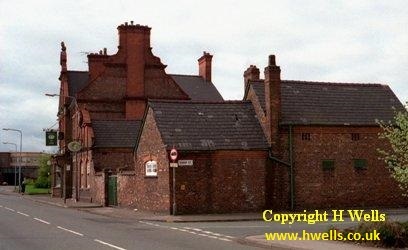 The Old Academy is just visible in its original place opposite the end of the street. 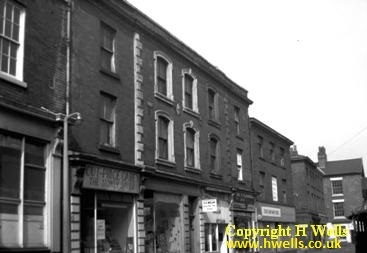 The clock above the pawnbroker's was saved by the Council and removed to Upper Bank Street opposite ther market. It has now been removed once again. 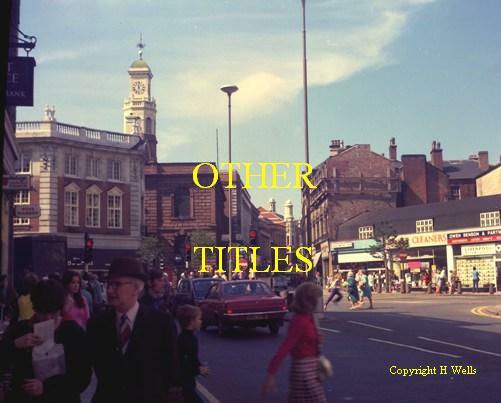 The same section of Mersey Street on Monday 21 August 1972, taken on 120 roll film. 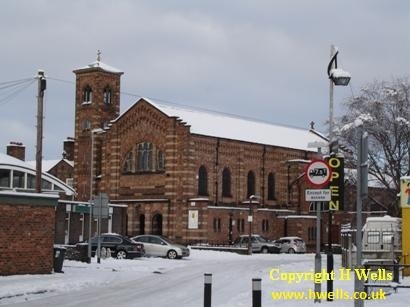 Did I then always complain about having to queue in traffic here? 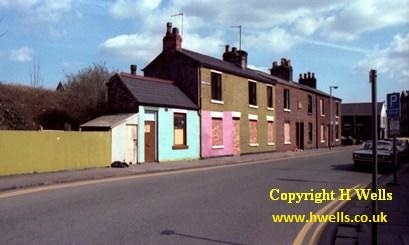 Old cottages, Mersey Street, boarded up ready for demolition. They rest on a stone plinth and are probably an eighteenth century rebuilding of a timber framed structure. The properties on this side of the road were not needed for the road widening and with a bit of imagination could have been kept. On nthe other side of the street old workshops and industrial buildingsa are ready to be removed. 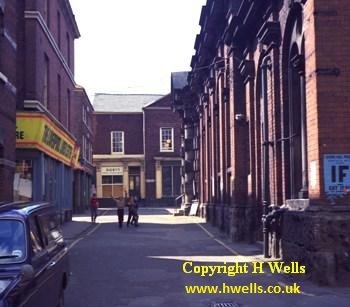 Furniture warehouse on the south side of Mersey Street in December 1976, since removed for road widening. 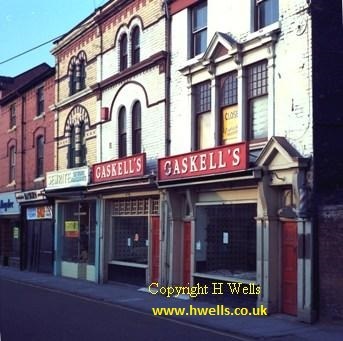 An interesting frontage to an older building on Mersey Street. 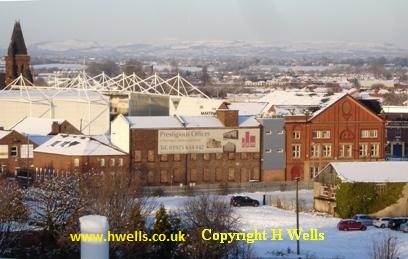 Note the new multi storey car park at the back. 1980. 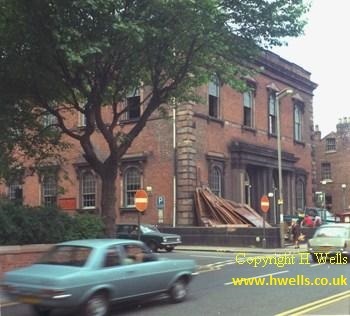 Mersey Street awaiting demolition early 1980. 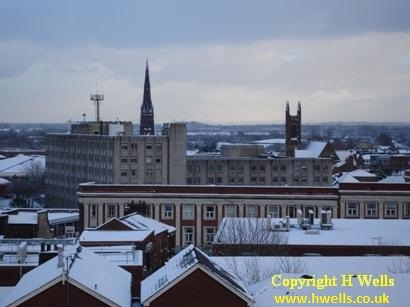 Taken from the new Market multi storey car park. 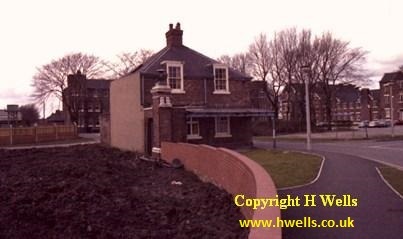 The end of Mersey Street showing the new road alignment nearing completion. Early 1986. 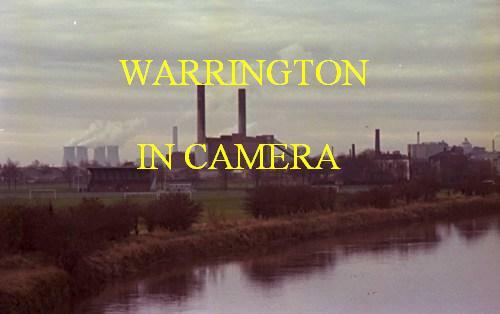 I have been taking photographs of the changeing face of Warrington since about 1971. 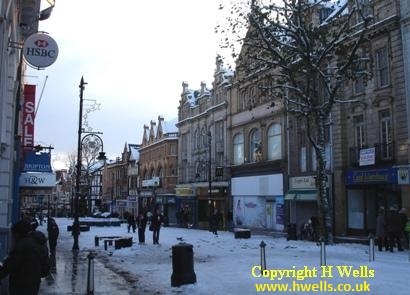 My favourite times for photography were Sundays, summer evenings and Thursdays when the town centre shops were closed and there were fewer people about. 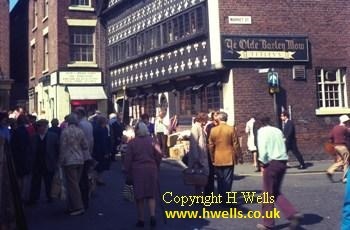 In the early seventies I used an old Agfa camera with a slow shutter speed of 1/50 second. Consequently my photographs could featue the blur of a passing car. Focusing was by guesswork or at infinity and exposure settings by judgment derived from experience. 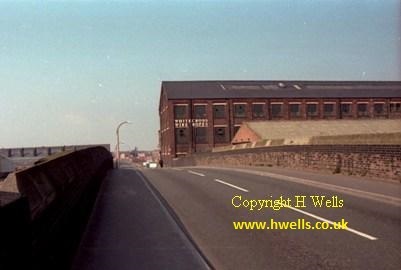 However, the quality of the 80 ASA 120 colour roll film was such that in good lighting condiotions I could achieve some reasonable results. From about 1976 I started using a Praktika LTL3 SLR camera with better focusing and more shutter speeds, but looking back I can see that the results were better with the old equipment. Most of my photography was done in black and white, which meant that I could produce fairly good prints at home in my darkroom. Once I had more than one SLR I was able to use one camera exclusively for slides and another for black and white. 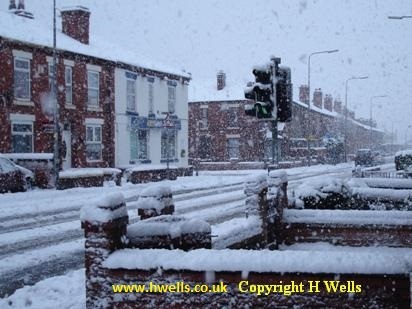 I then moved on to Olympus cameras which I found light to carry round and easy to handle. Before the advent of digital photography it was essential to wait for the right lighting conditions, time of day, time of year, etc. for a particular shot. And you had to get it right. You couldn't afford to waste valuable film on multiple shots and no mucking around on the computer to improve it afterwards, although you could manipulate certain things in the darkroom. This could be quiite frustrating, as once the film was developed, weeks nor months later, you might find that the shot was spoiled in some way, or the film was lost or damaged during processing and the opportunity to photograph a particular building might then be lost forever. 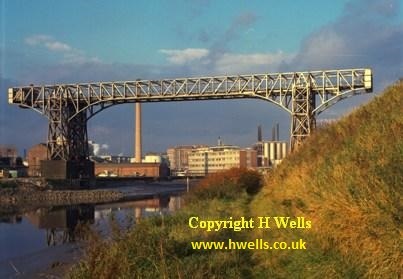 Crosfields' Transporter bridge, Bank Quay, photographed at low tide, November 1973. 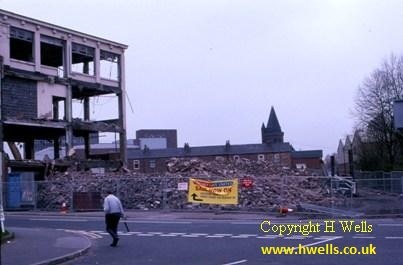 The Warrington New Town's plans for the town centre involved demolition and reconstruction on a large scale in the late 1970s and early1980s. 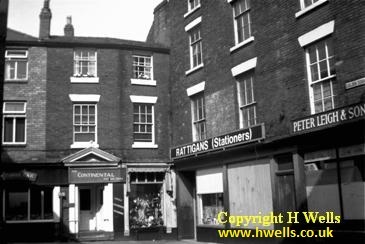 This was good news for photographers and I was very busy in that period recording the old buildings and taking advantage of the new perspectives created. 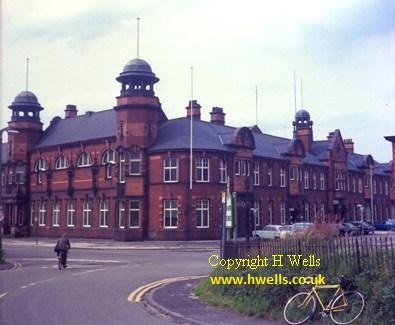 The Legh Street and Market car parks in particular afforded spectacular views of the town. 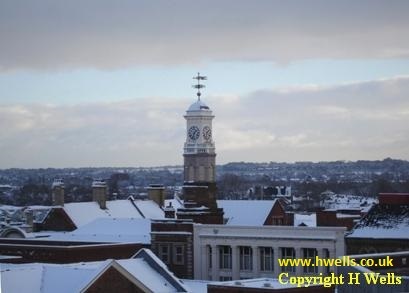 From the top of other side of the Legh St car park. Allen St is in the foreground. March 1980. 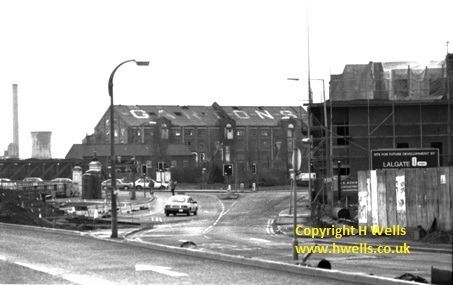 Golborne St from the Legh St multi storey car park with a 135mm lens, April 1980. 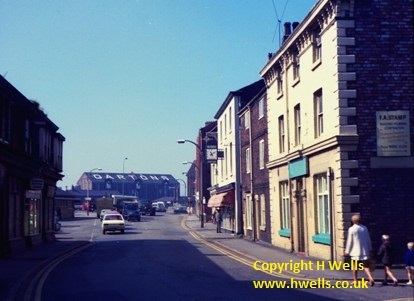 Warrington market footbridge, Saturday 26 April 1980. 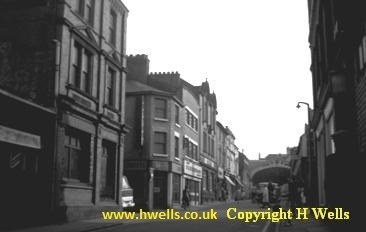 An attractive feature of the new car parks were the footbridges, all different and offering views of the town below. 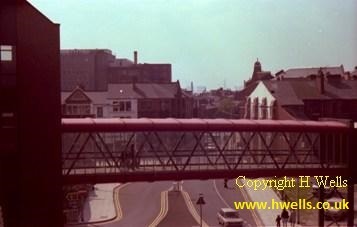 Footbridge from Legh St car park to the bus station and mall, April 1980. 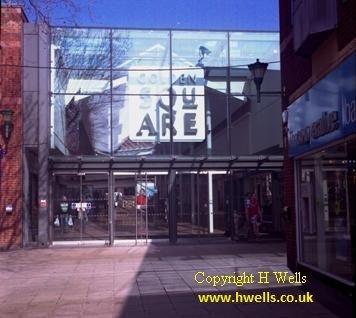 The new Golden Square shopping centre was completed in stages. 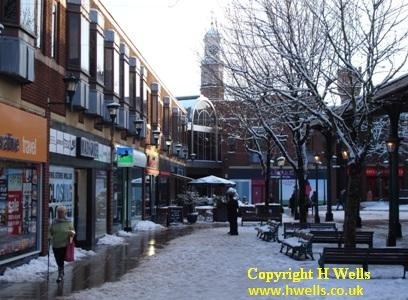 In this vioew from Legh St car park, the bus station and mall are open, but construction in the old market place and along Horsemarket St is still going on. January 1980. 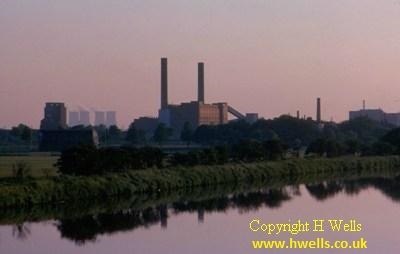 Howley power station, December 1979. 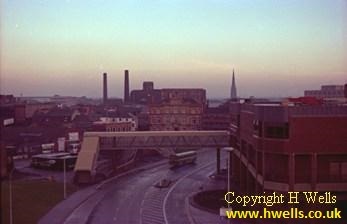 So many shots of the town centre at this time featured the bpower station somewhere on the skyline. 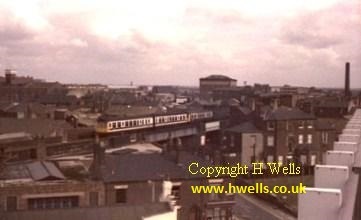 A clear view of it was opened up when the adjacent terraced streets were demolished in the 1970s. 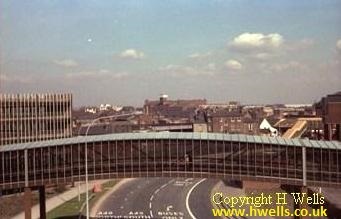 Fropm Kingsway Bridge, September 1978. In the left distance we can see the reason theb power station was to close. 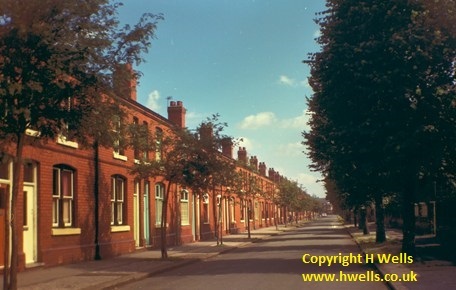 Fennel Street is now a dual carriageway. 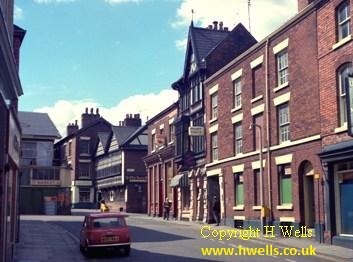 On the left and right are buildings of Flemings Tannery and in the right distance is the Raven. On the skyline is the unavoidable power station. 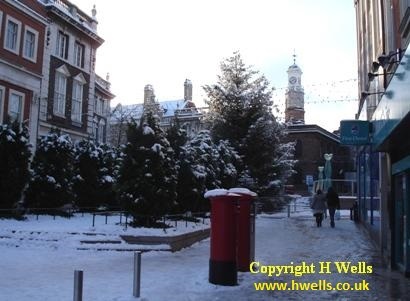 Taken in the week a new one way system came into force in the town centre via Scotland Road and Academy Street. 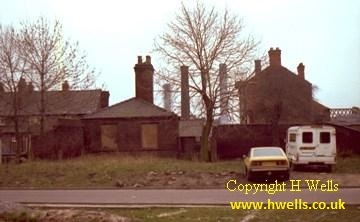 Orford Lane backs in the winter of 1979-80. An extra house has been squeezed in. 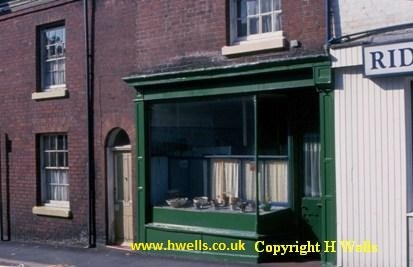 The corner shop was typical of many in the area. 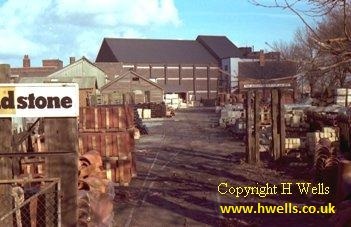 Warrington Slate's yard occupied the site of the first Arpley Station. Note the rail tracks. Early 1980. 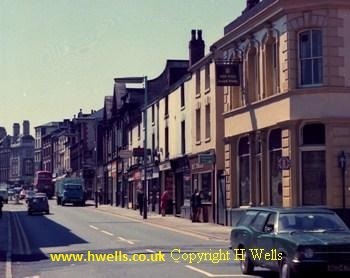 Stanley Street, Saturday 26 April 1980, with cars of the period. 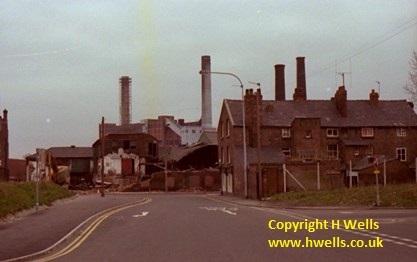 Allen Street has just been demolished. 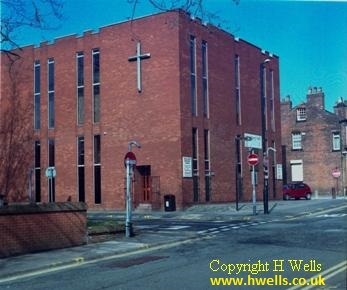 Wycliffe Church will soon follow. April 1980. The nearby St Paul's also awaits its fate. July 1980. 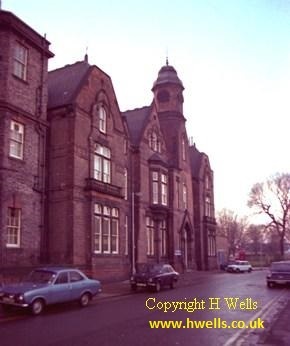 Warrington Infirmary, Kendrick Street, February 1980. The courts now occupy part of this site. 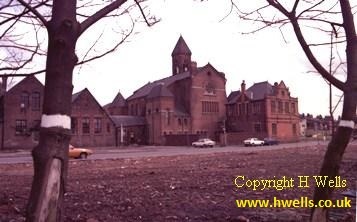 Opposite the Infirmary was the old Holy Trinity and St Paul's school, seen in 1984. 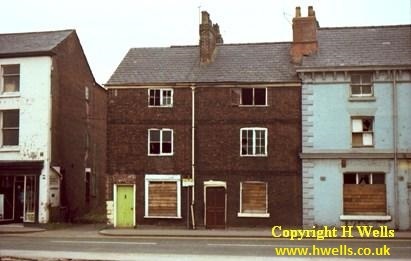 Further along Kendrick Street was this row of houses, cleared out ready for demolition in early 1980. This is now Midland Way. The central stone plaque reads Ebenezer Cottages AD 875. They weren't Anglo Saxon, the 1 had disappeared. 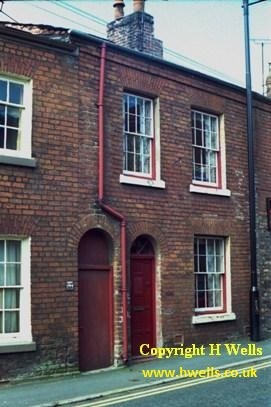 Mounted on the end of the houses is one of the old blue and white enamel street name plates. 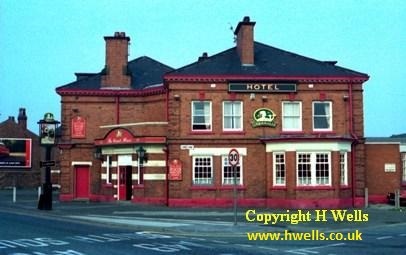 The Longford Hotel from Winwick Road in 1996. The Technical College has now been rebuilt. 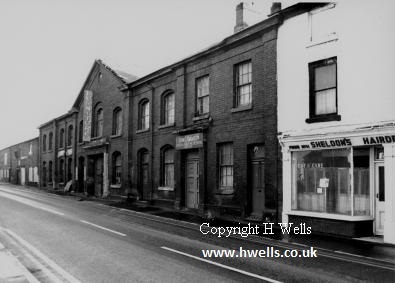 The other side of the Longford Hotel on Long Lane. 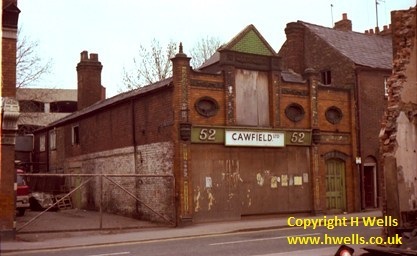 This has now been demolished and replaced by a car sales area. 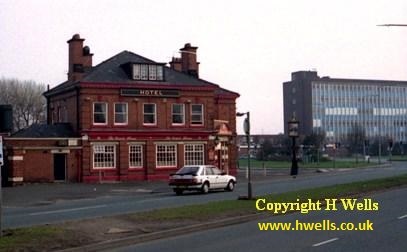 The Kingsway on Kingsway South, 1996. 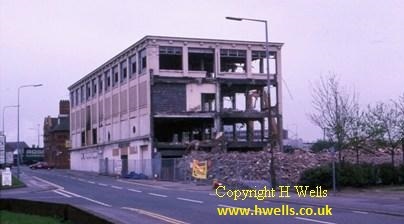 The Kingsway in process of demolition. December 1999. 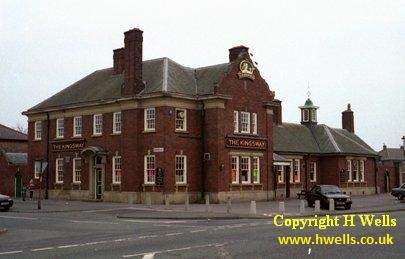 The Albion, Battersby Lane, one of three pubs (including the Wheatsheaf and the Orford) for which on behalf of Warrington Civicn Society I managed to secure Grade II listing in 1998. 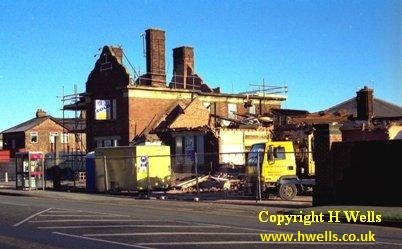 The lion statue, symbol of Albion, sat on the top of the gable for over 100 years before it disappeared recently when the pub was being repainted. One imagines it made an impressive garden ornament for someone. 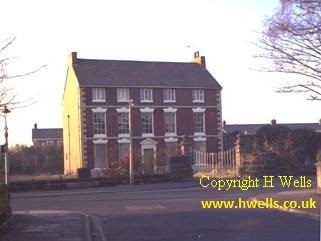 Photo taken spring 1996. Elmwood Church complex. 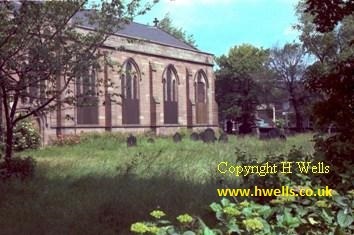 The large brick church, which stood on the left, has already been demolished and the hall and school rooms stand roofless. Autumn 1994. 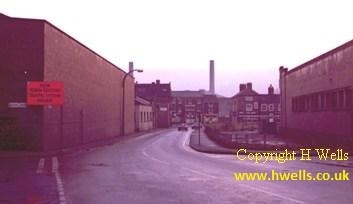 Froghall bridge, looking down Priestley Street. The robed figure on the right is Brother Francis. April 1980. 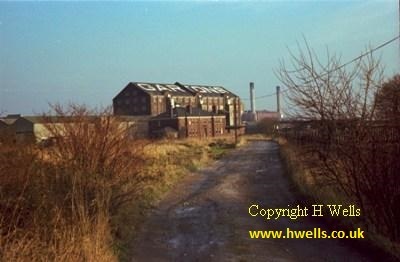 Looking towards the old established Warrington seed firm of Gartons at Arpley, seen from the Slutchers lane direction, December 1979. 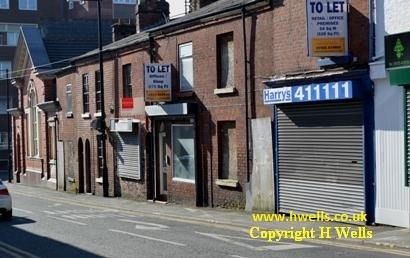 The firm was taken over by a rival company and subsequently closed down. 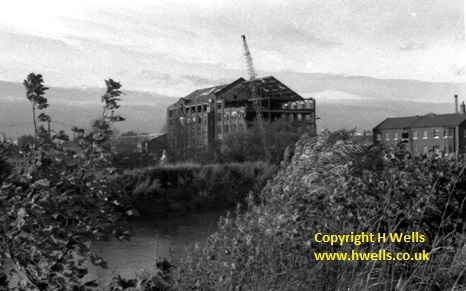 Gartons warehouse seen from across the river under demolition in 1988. 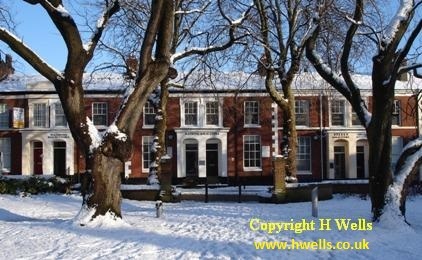 Chetham House, Orford. 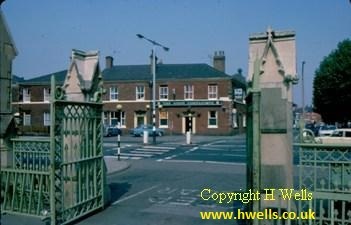 Although the handsome Grade II listed house was demolished, the gates were retained. April 1974. 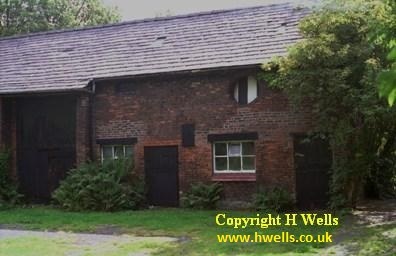 The Grade II listed Ford Farm, Lower Walton, was classified at risk by English Heritage. It has now been demolished. Slide taken, unfortunately against the light, in 1995. 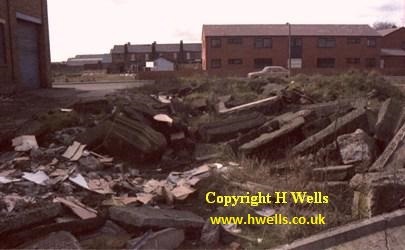 Early in 1998 the former Alliance Boxworks on Orford Lane was demolished for a car sales site. This shot shows the concrete boxlike structure of the building. It was finished in an Art Deco style. 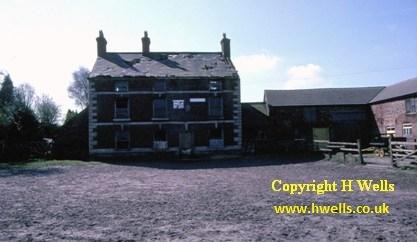 Orford Farm, Sandy Lane, in August 1996. Listed Grade II. Now destroyed by arsonists. Orford Farm barn, listed Grade II, now destroyed by arsonists. 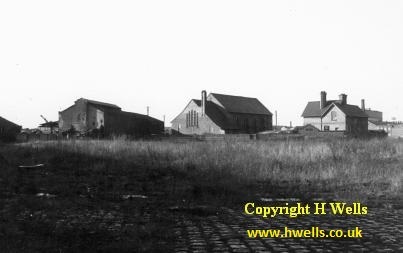 Old foundry, St Paul's church and vicarage, seen from Battersby Lane in 1976 after demolitionn of the school which stood in the foreground. There is now a housing development and a small park here. 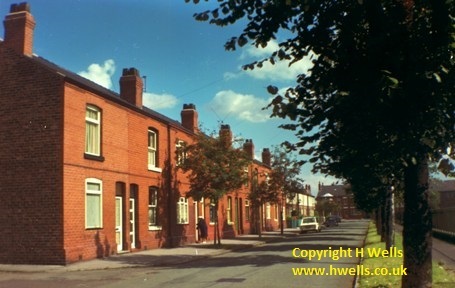 Houses in Cairo Street, 1993. Old shop in Cairo Street, 1995. Cairo Street 2003. No comment necessary. 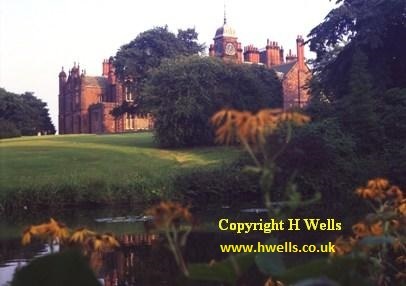 The Walton Hall estate was acquired by the Council from the Greenall family and the grounds opened as a public park. 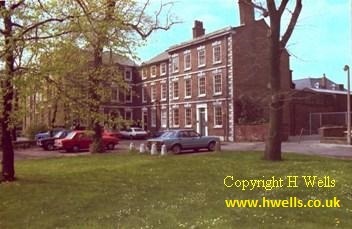 The Victorian Walton Hall is seen here on the evening of Saturday 11 August 1973, around 7pm according to the clock. 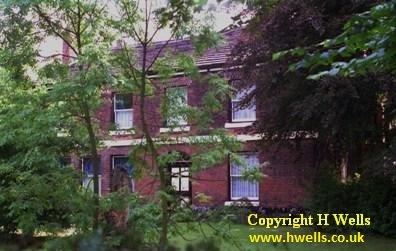 Most of the hall has since been demolished. 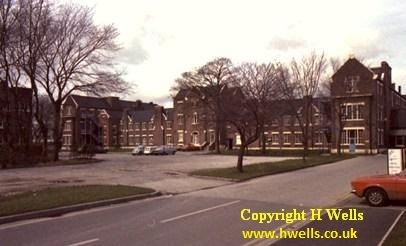 The Warrington Union workhouse on Church Street was replaced by large new premises at Whitecross. 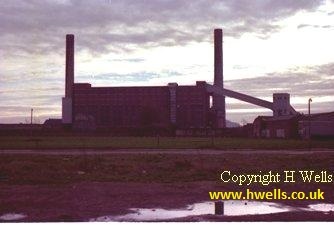 This is the main building early in 1980, with chimney stacks removed, but still impressive. Most of the original building has recently been demolished. An imposing entrance with a stone archway was created at the end of Guardian Street. Early in 1980 everything had been swept away except for this lodge and a single gatepier. The masonry from the central archway was dumped nearby. The arch was too small to admit modern vehicles.